Practically insoluble in water, sparingly soluble in ethanol (96 per cent). 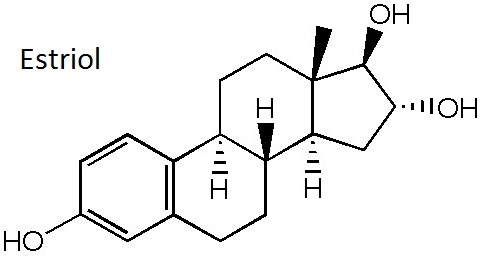 Estriol belongs to natural hormone and is the metabolite of estradiol in vivo. It is mainly presented in the urine. Estrogen has a relative small activity with the oral activity being 6 times as high as estrone but being weaker than estradiol with non-carcinogenic effects. After its administration, the in vivo estradiol levels did not change. Estriol has selective action on the vaginal and cervical canal but has no effect on the uterus and endometrium entity. Animal experiments have shown that estriol has a stronger effect on vaginal epithelial keratosis than estradiol, thus being able to promote vaginal epithelial hyperplasia, superficial cells keratosis, mucosal angiogenesis and vaginal epithelial wound healing, but having a weak effect on the weight gain of mouse uterus. At the same time, estriol can enhance the function of cervix cell, causing the cervix muscle fiber hyperplasia and increasing the cervical elasticity and softness. In addition, estriol has feedback inhibition on the hypothalamus and pituitary but does not inhibit ovulation while only having significant impact on the corpus luteum and therefore can be used as the auxiliary drug in the medium-term labor induction and artificial abortion and for the treatment of various kinds of menopathy. Estriol also has significant effect on the hematopoietic system and can reduce vascular permeability and fragility. Therefore, it can be used for the treatment of various kinds of hemorrhage. It also has effect of rapidly increasing the peripheral leukocytes and generally begins to take effect at 1 to 3 days after treatment but with a shorter duration of action and is effective in treatment the leukopenia induced by radiotherapy and chemotherapy. It can be absorbed from the gastrointestinal tract and skin but is susceptible to damage upon oral administration and is therefore mainly subject to intramuscular injection and topical usage. It is metabolized in the body to less-active estrone and estriol and can be inactivated when being combined with glucuronic acid and sulfuric acid and further excreted in urine. It can be used for treating cervicitis, especially suitable for treating menopausal syndrome and senile vaginitis. It can also be used as the adjuvant drug for middle-term labor induction and artificial abortion. It can also be used for treating prostatic hypertrophy and prostate cancer. In addition, it still has a rapid role in increasing the peripheral leukocytes. It generally takes effect at 1 to 3 days after the treatment but with a short duration period. It also has efficacy in treating leukopenia caused by chemotherapy or radiotherapy as well as reducing the vascular permeability and fragility and can be used for the treatment of various kinds of hemorrhage. It also has quick hemostasis effect on menorrhagia, hysterectomy or tonsillectomy. There are temporary breast swelling or lumps, menstrual disorders which can self-limiting and recovery after discontinuing the drug. In oral administration, it has been occasionally observed of loss of appetite, nausea, vomiting, abdominal pain and so on. Estriol is produced through the hydroxylation of carbon 16 in dehydroepiandrosterone at fetal adrenal; it further enters into the placenta and the metabolism by the placental syncytiotrophoblast cells. It is then released into the maternal blood with the free estriol absorbed by the maternal liver and further combined into glucuronic acid or sulfuric acid estriol that are further excreted by the kidneys. Therefore, the estriol in the urine is all in the form of conjugated estriol while the estriol in the blood contains both free type and bound type with free form accounting for about 10 to 30% and the rest being in bound form. Determination of estriol in the urine of pregnant women with a spectrophotometer has been widely used clinically. There are other common methods including radioimmunoassay. Estriol is not contained in the blood of non-pregnant women. According to the measurement of the Shanghai Second Medical Ruijin Hospital, upon 26 weeks of pregnancy, the plasma free estriol is 4~6ng/ml while upon 36 weeks, it is 10~12ng/ml and it is 19ng/ml or more in full term but with large individual differences. The total plasma estriol value, at 25 weeks of gestation, is 50ng/ml and is 200ng/ml at 40 weeks of pregnancy. At 24h, the urine estriol was 8.12 ± 0.28mg at 28 weeks of pregnancy and was 19.81 ± 8.28 mg in full term. It is generally believed that after 36 weeks of pregnancy, if the urine content at 24 h > 15mg, the value is normal; 12~10mg is alert value while <10mg is dangerous values. Since the major precursor of estriol during pregnancy comes from fetus, being different from the estrone and estradiol that is from the mother, the determination of estriol may reflect the condition of fetal development. When some fetal malformations and maternal or fetal diseases affect fetal development or cause fetal asphyxia, it is always accompanied of decrease of estriol. However, due to the great daily fluctuations of estriol level, it is generally measured for 4 to 5 times at least for some time in order to determine whether the level of estriol is really low. The estriol level in mild hypertension of pregnancy are often normal before 34 weeks while is maintained at low level after 34 weeks while the level significantly drops upon severe pregnancy-induced hypertension. For pregnant women upon exceeding the expected date, you can continuously measure the urinary estriol in 24h. If it is always higher than 25mg, you can still wait under close observation; if it is less than 10mg, the fetus is at risk and should be subject to positive treatment. Owing to lack of hypothalamus, non-brain child has pituitary hypoplasia and small adrenal gland. Since the supply of the raw material for the placental synthesis of estriol, 16-hydroxy isopropyl DHEA is in insufficient amount, the estriol in urine of pregnant women is very low with most being below the normal 10%. 1. It can be used for treating cervicitis and especially suitable for treating menopausal syndrome and senile vaginitis. 2. It can also be used as the adjuvant drug for middle-term labor induction and artificial abortion. 3. It can also be used for treating prostatic hypertrophy and prostate cancer. 4. It still has a rapid role in increasing the peripheral leukocytes. It generally takes effect at 1 to 3 days after the treatment but with a short duration period. It also has efficacy in treating leukopenia caused by chemotherapy or radiotherapy. 5. It can be used for reducing the vascular permeability and fragility and can be used for the treatment of various kinds of hemorrhage. It also has quick hemostasis effect on menorrhagia, hysterectomy or tonsillectomy. 1. Pregnant and lactating women, patients of breast hyperplasia, breast lumps, gynecological cancer, and aplastic anemia patients should be disabled with minor patients being not suitable for using it. 2. Patients of heart (liver, kidney) disease, hypertension, diabetes, epilepsy, migraine (including medical history), endometriosis, fibrocystic breasts, porphyria, hyperlipidemia or having history of pregnancy itching and herpes should take with caution. 3. If prescribed therapy doesn’t work, it is not suitable for increasing the dose or extending the usage time. It can be used in combination with estradiol with competitive antagonism. It should be sealed upon shading for storage. It is white crystalline powder with the M.p. being 283 ℃, relative density being 1.27, and the specific rotation being [α] 25D + 34.4°(pyridine) and 25D + 58°± 5°(4%, dioxane). Its ethanol solution has maximum absorption at the wavelength of 280 nm. The crystal is insoluble in water, slightly soluble in ethanol (1: 500), diethyl ether, chloroform, dioxane and vegetable oil and easily soluble in pyridine and alkali hydroxide solution. It belongs to estrogen drug. It can be used for treating leukopenia, various kinds of menopathy, senile vaginitis, and menopausal syndrome. You may also get temporary breast swelling and lumps, menstrual cycle disorders with self-recovery after stopping the drug for about 1 month. Patients of breast hyperplasia, breast lumps, and cancer potentially being related to female hormone-related cancer, aplastic anemia and liver disease patients should be disabled. Take estrone as raw material; go through acetylation, epoxidation, and reduction to obtain the estriol products. Estrone [acetylation] → [16, 17-epoxidation] → [rearrangement] → [Restore] → [hydrolysis] → finished product of estriol. Estrone acetate successively goes through followed enolization, acetylation, epoxidation and reduction to obtain it. White or almost white, crystalline powder. ChEBI: A 3-hydroxy steroid that is estra-1,3,5(10)-trien-3-ol substituted by additional hydroxy groups at positions 16 and 17 (16alpha,17beta-stereoisomer). Estriol, estra-1,3,5(10)-triene-3,16 ,17 -triol, is available for compounding into several differentformulations for use in HRT. It can be used alone or in combinationswith estradiol (Bi-Est) or with estradiol and estrone(Tri-Est). Suspected carcinogen with experimental carcinogenic, neoplastigenic, tumorigenic, and teratogenic data. Other experimental reproductive effects. Mutation data reported. A steroid drug for the treatment of menopause. When heated to decomposition it emits acrid smoke and irritating fumes. 50-27-1 US $50.00 / KG 10G 99% 10MT Hubei XinRunde Chemical Co., Ltd.
50-27-1 US $50.00 / KG 1KG 99% 20 MT Hebei Huanhao Biotechnology Co., Ltd.